Looking for a way to shake up your fitness routine? Heat up the cold winter months with this sizzling offer! 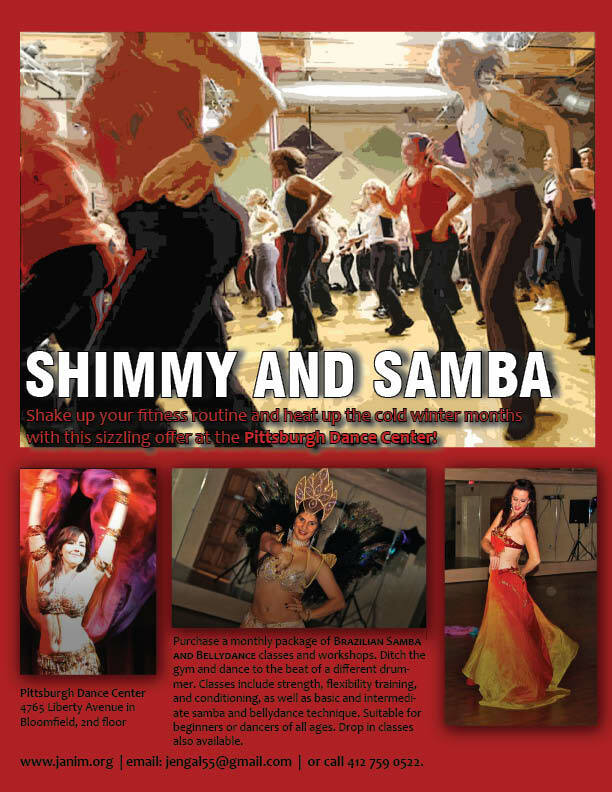 This January, the Pittsburgh Dance Centers begins offering an unlimited monthly package of Brazilian Samba and Bellydance classes and workshops. Ditch the gym and dance to the beat of a different Brazilian or Middle Eastern drummer. Classes include strength and flexibility training and conditioning, as well as basic and intermediate samba and bellydance technique. Classes are suitable for beginners or dancers of all ages. Drop in classes are also available. The monthly unlimited bellydance and samba package will be available beginning January 1st, 2012. Package cost is $110 for one month (a savings of $50!) Buy package here online or in class! Next PostNext Amartia of Maryland!